MacRapidizer is the PUP that uses misleading techniques to prevent removal. Use Reimage to locate malicious components and get rid of them faster than with uninstall instructions. A full system scan blocks virus reappearance and prevents traffic to malicious domains. MacRapidizer is a false system tool created for MacOS as an ultimate way to improve the computer's performnace. MacRapidizer is a false optimization tool created to allegedly improve the functionality of MacOS. However, this system tool is considered to be a potentially unwanted program as it infiltrates the system thru a deceptive marketing technique called “bundling” and then displays exaggerated alerts to sell its license. As a result, people sometimes do not notice how the unwanted app got into their computer system. However, if you spot this fake optimizer, you should remove MacRapidizer as it will only try to trick you. This program offers a “wide range of abilities” – cleaning browser history, taking care of some computer issues, and so on. In reality, these “powers” are used just to trick users into buying the full version. Make sure you are careful and do not fall for these fake errors as their elimination won't improve your Mac's functionality. Even more, the tool will try to convince you to buy the full version in order to “take care of the problems”. Make sure you deny this suggestion too. Fake system tools such as MacRapidizer virus are created only to bring profit for the developers. 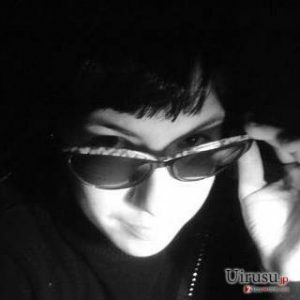 You can test its usefulness by installing a reputable anti-malware tool. Once you do so, perform a full computer system scan and measure the results with the ones provided by the fake system optimization tool. We are sure that you will see a big difference here and all the errors that were shown by the fake app appear to be truly false. Due to all beforementioned reasons, you should get rid of MacRapidizer from your computer system with all its components permanently. Even though this Mac optimization tool promotes itself as “the best Mac cleaning tool”, this is all just one big lie. Get rid of the potentially unwanted program by using reliable antivirus programs. If you are looking for the repair and optimization software, use Reimage instead. 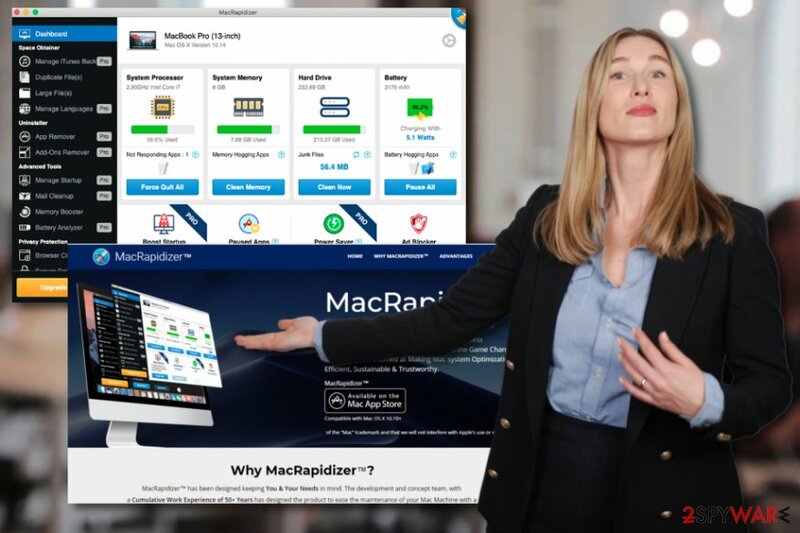 If you are likely to perform the MacRapidizer removal manually, scroll down till you find some instructions below this article. We have provided them for you so that the elimination process would be easier to carry out. However, you need to make sure that the PUP does not leave any components on your web browser. If it did – pay big attention and delete all browser extension and add-ons that were added by the cyber threat. 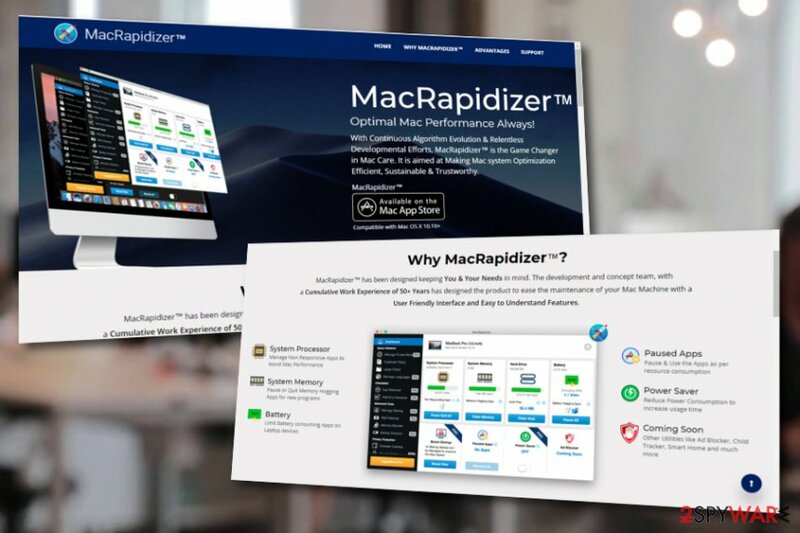 MacRapidizer is a fake optimization program which tries to convince people to buy the full version of the tool. Moreover, potentially unwanted applications, including fake system optimizers, can enter the system thru “bundling”. The rogue application comes together will regular software that you download and install from the Internet. Good news, you can take some actions against this unwanted installation. All you have to do is choose the Custom/Advanced installation mode and you will be able to control all incoming downloads. You can remove MacRapidizer virus by using anti-malware software. These programs will ensure you that the entire process will be completed safely and effectively. However, if you decide to get rid of the cyber threat on your own, make sure you delete all rogue components from all infected web browsers such as Google Chrome, Mozilla Firefox, Microsoft Edge, Internet Explorer, and Safari by resetting these web browsers. Performing the MacRapidizer removal is necessary if you want to get rid of all the annoying pop-ups and pop-unders that show because you have this potentially unwanted program installed on your system. If you are keen on protecting your computer system from various infections or taking care of system-related issues, make sure you download and install a trustworthy tool which will help you fix all problems. Wait until you see Applications folder and look for MacRapidizer or any other suspicious programs on it. Now right click on every of such entries and select Move to Trash. ^ What is a Mac?. Digital Unit. About digital skills. ^ Scareware. Wikipedia. The free encyclopedia. ^ Margaret Rouse . PUP (potentially unwanted program). Search Security. Tech Target. ^ NoVirus.uk. NoVirus. Cybersecurity news website. This entry was posted on 2018-11-12 at 03:04 and is filed under Adware, Viruses. You can quickly scan the QR code with your mobile device and have MacRapidizer manual removal instructions right in your pocket. How did you remove MacRapidizer?